Portobello Road Market – This world famous market is full of quirky charm. While it bills itself as being “The World’s Largest Antiques Market,” there’s much more to it than that. There are hundreds of specialist shops as well as an extensive fashion market. Sections of the market along Portobello Road are open seven days a week, however, we recommend visiting on a Saturday when it’s in full swing. Nearest tube station: Notting Hill Gate. Opening times: 09:00 – 18:00 Mon – Wed, 09:00 – 13:00 Thur, 09:00 – 19:00 Fri and Sat. Borough Market – The oldest market in London, Borough Market is just off of the scenic Thames River and has existed in its current location since the 13th century. 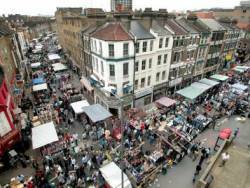 It is particularly known for its quality British and International fruits and vegetables and many world famous vendors have stalls in the market. The market is open six days a week. Nearest tube station: London Bridge. Opening times: 10:00 – 17:00 Mon – Tues, Full market: 10:00 -17:00 Wed – Thur, 10:00 – 18:00 Fri, 08:00 – 17:00 Sat. Greenwich Market – Set on a World Heritage site, the Greenwich Market is full of fine arts and crafts, collectables and vintage fashions. The market is also right next to Cutty Sark and Greenwich Park, both excellent places to take in some history. Although the market is open six days a week, the weekends are when you catch the majority of traders. Nearest stations: Cutty Sark DLR Station and Greenwich Rail Station (DLR and Overground services). Opening times: 10:00 – 17:30 Tue – Sun. Brick Lane – Probably one of the most well known markets in the city, Brick Lane has a little of everything. From street art, to second-hand goods, there are some incredible bargains. The market is also known for its street performers and local eateries. Nearest tube station: Shoreditch High Street and Liverpool Street. Opening times: 09:00 – 17:00 Sun. Old Spitalfields Market – Within several minutes walk of Brick Lane, the Old Spitalfields Market is just off of Commercial Street beneath a Grade II listed structure. The market is open seven days a week and there are many special events and markets, including its new Style Market on Saturdays featuring clothing from original designers, one-offs and accessories. Nearest station: Liverpool Street. Opening times: 10:00 – 17:oo Mon and Wed for general stalls, 09:00 – 17:00 Thur for the antiques and vintage market, 10:00 – 16:00 Fri for the fashion and art market, 11:00 – 17:00 on Sat for themed markets and 09:00 – 17:00 Sun for general stalls. Camden Market – One of the newer markets in London, Camden Market has been going for 30 years strong and has quickly become one of the best markets in the city to pick up vintage and retro goods. While it has become quite the tourist location, it still has plenty of alternative roots. Nearest stations: Camden Town and Chalk Farm Road. Opening times: 10:00 – 18:00 Mon – Sun.